Mainland Spain has something for every taste. Whether you're dreaming of exploring historic monuments or have your heart set on a week spent finding the perfect beach. Mainland Spain ticks all these boxes and so many more. In fact, you can find out just how many below. Mountain peaks, quaint fishing harbours, amusements parks – they're all waiting to be discovered. Uncovering Andalucía is a dream come true for those of you that just love culture. This corner of mainland Spain is a melting pot of Spanish tradition and architectural marks left by invading empires. The Moors may have fled these shores in the 15th century but you could argue that they still own little pockets of Andalucía today. 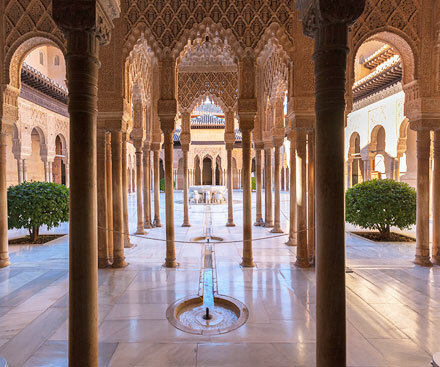 With landmarks like Seville's Alcazar Castle and Granada's Alhambra Palace capturing visiting hearts hundreds of years on. Roman's came for their piece of the pie centuries before. They clearly planned on staying for a lot longer than they did, with many of their buildings still standing strong. Cordoba is home to some of Andalucía's finest Roman relics. Picture towering stone columns, impressive arched bridges and plenty more of that Roman flair. For every amazing monument there's a traditional whitewashed village, brimming with authentic Andalusian charm. Wandering through the narrow streets gives you a flavour for the local life. And those tucked away in the mountains and countryside make exploring feel extra special. It would be a crime to come all the way to Andalucía and not spend a little time on the sand - this is Spain's longest coastline after all! Blessed with beaches for whichever mood you happen to be in that day. Quiet coves for when you just need some rest and relaxation, vast stretches that offer watersports for when you're feeling adventurous. Families will also find sheltered beaches that make sandy playgrounds for the whole gang. You really will find a beach for every occasion in this part of mainland Spain. With the Montgo mountain range towering above, the towns of Gandia and Denia offer spectacular views of these impressive peaks. Each has their own charming harbour, with colourful boats and buildings that create a vibrant contrast to the dark shades of the mountains. 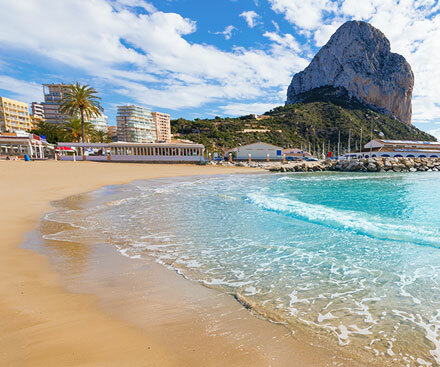 Calpe might not be home to mountains, but the Peñón de Ifach is impressive in its own right. This craggy rock formation stands at 300m tall, meaning that discovering the Valencian heritage comes with breathtaking panoramas. There's more culture a little further down the coast, where Murcia and Elche are jam-packed with sights and monuments. Historic statues and a wonderfully crafted basilica meet 11,000 exotic palm trees in Elche. While Murcia is a cocktail of museums and religious buildings. The 14th century cathedral, the native art of Museo Salzillo and an 18th century Bishop's palace are enough to fill your cultural boots. A close neighbour of nearby Andalucía, Almeria holds its own Arab past and charm. Holidaymakers are often faced with the tricky choice between the two, so it's no surprise that the Moors couldn't decide either. Almeria was once vital in keeping watch for approaching enemies. The Alcazaba Fortress offers the ideal vantage point, from its hilltop position. Fear of invasion is long gone, but you still might opt for a short stint as lookout – once you lock eyes on the landscape and sea below. 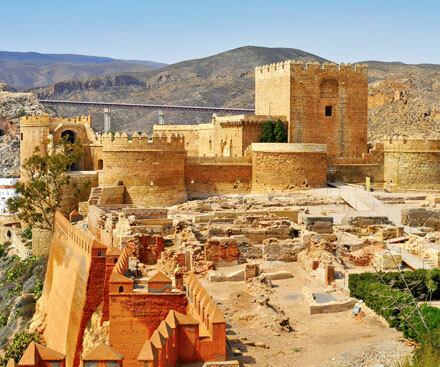 When you've finished keeping watch, why not explore more of Almeria's history? Taking a guided tour through the Civil War Shelters is an eye-opening experience. This is where locals sought shelter from falling bombs. Putting yourself in their shoes will give you a real insight into a tumultuous point in Spain's past. It's not all history, there's a lot more to Almeria than Arab invasion and not so civil feuds. And if you're searching for some local charm, you've come to the right region. Traditional coastal villages like San Juan de los Terreros are dotted with fishermen's cottages and quaint harbours. There's plenty more Almerian culture tucked away among the valleys, so finding some peace and quiet is a piece of cake. Brilliant beaches are also in touching distance of our Almeria villas – perfect for when only the sound of the sea will do. Where better to soak up some rays than the 'Sunshine Coast'? With more than 300 days of sunshine each year, it's no surprise that the Costa del Sol remains just as popular today as it was decades ago. But don't worry, you won't be fighting for sunbathing space! There's more than 150km of coast to choose from, with golden sands found all along the shore. If you're looking for somewhere tucked away from the crowds, head to Playa La Viborilla. This quiet cove feels like your exotic escape, with palm trees keeping this tropical paradise a hidden delight. Sometimes you just need that seaside hustle and bustle! A beach with space to spread out or indulge in some sandy sports and activities - Playa del Campo de Golf in Malaga is the answer. A whopping 2250m of sand awaits, with stunning mountain views making those beach days extra special. 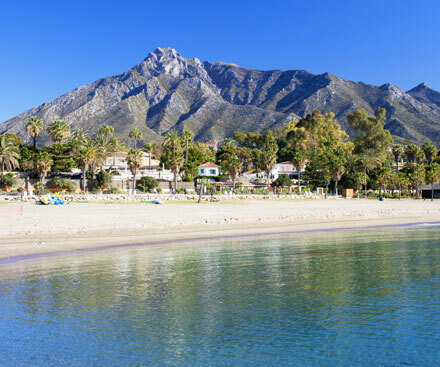 If you're heading away with little ones, or you're a big kid looking for a little childlike enjoyment of your own, Benalmadena is a coastal hub of fun. Tivoli World Amusement park has been putting smiles on faces for more than 40 years. You'll find high octane rollercoasters, rides that offer just enough thrills for younger kids and go karts for budding racing drivers of all ages. While Selwo Marina is your Costa del Sol gateway to the animal kingdom. Sea lion shows and dolphin demonstrations are highlights of any trip here, as you watch these wonderful creatures at their brilliant best. An exciting challenge awaits a little further down the coast, at Mijas Costa's Water Park. Put yourself to the test on the inflatable obstacle course, sitting just off the shore. Trampolines, slippery slides and so much more are waiting to be conquered off the Costa del Sol.